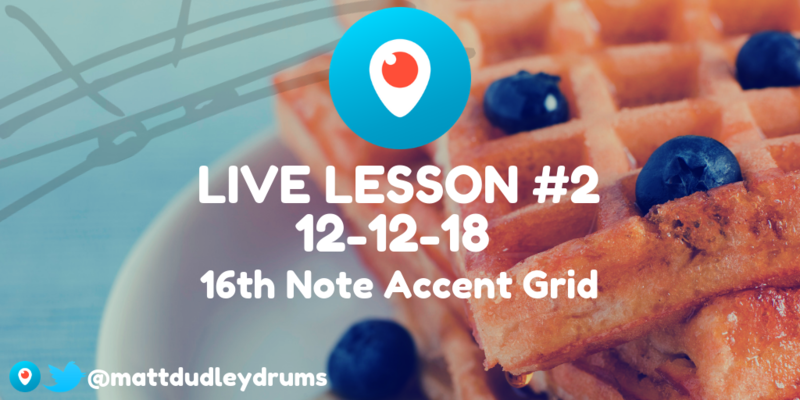 Welcome to the 2nd installment of my Live Lesson series! Last week we covered The Four Basic Stroke Types along with some accent exercises. This week we will continue working with accents and hand mechanics. The 16th Note Accent Grid isn’t anything new to some of us. In this case we are not only learning the grid with alternating strokes and accents, but we are breaking up the hands into different groups and exploring different possibilities while incorporating the four basic stroke types. Section 1. Alternating strokes (R, L, R, L). Section 2. Individual hands. Play all right’s, then all left’s. You can also try this one in unison (R/L). Section 3. Right hand lead. Accents are on the right, tap strokes on the left. Section 4. Left hand lead. Accents are on the left, tap strokes are on the right. Tip!​​ When playing the above exercises be sure to start very slow and focus on the movements of each hand. ​Stick heights, stroke types, timing, posture​​. These all should be the focus when building your foundation. Please don’t treat this as a race to finish the exercise. If you do so it will show in your playing. Treat this like the martial arts of drumming. Proper form along with a great sense of time and feel. That’s what we are trying to achieve. Practice smart and have fun!